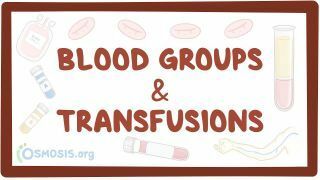 Osmosis: Blood groups and transfusions. (2019, April 24). Retrieved from (https://www.osmosis.org/learn/Blood_groups_and_transfusions). Blood transfusion is generally the process of receiving blood products into one's circulation intravenously. Transfusions are used for various medical conditions to replace lost components of the blood. Early transfusions used whole blood, but modern medical practice commonly uses only components of the blood, such as red blood cells, white blood cells, plasma, clotting factors, and platelets. A blood type (also called a blood group) is a classification of blood based on the presence or absence of inherited antigenic substances on the surface of red blood cells (RBCs). These antigens may be proteins, carbohydrates, glycoproteins, or glycolipids, depending on the blood group system. Some of these antigens are also present on the surface of other types of cells of various tissues. Blood types are inherited and represent contributions from both parents. The two most important ones are ABO and the RhD antigen; they determine someone's blood type (A, B, AB and O, with +, − or Null denoting RhD status). is the type of immunoglobulin that is the Anti-Rh blood group antibody. A 45-year-old man is evaluated in the surgical intensive care unit for a seizure. This is his first seizure episode. He was admitted to the hospital earlier in the day after being in a motor vehicle collision and losing a large amount of blood. Three units of packed red blood cells were transfused on arrival to the emergency department. Laboratory investigations show serum phosphate level within normal limits. Which of the following is the most likely cause of his seizure?